Of course one problem in basing a memoir like this around Doctor Who is that it's all been done before and if I'm not careful, people are going to accuse me of ripping off 2006's Moths Ate My Doctor Who Scarf (so I'll have to be careful not to mention John Abineri) or even 2007's Dalek I Loved You (so I'll have to be careful to sound like I actually like Doctor Who). There was something about the beginning of the seventies that felt like a big change, even to someone as young as I was at the time. It still feels as if everything in my life up to the end of 1969 was in black and white, whereas in 1970 I started being broadcast in colour. Even though we moved to London in (late?) 1968, my memory has shifted this event to 1970 for dramatic reasons and so the move from Birmingham to London also seems to have been simultaneous with the transition from monochrome to colour. Likewise, I don't remember watching any episodes of Doctor Who featuring Patrick Troughton in London even though I must have done. It seems like everything happened at once; we moved house, everything went colour and there was a new Doctor Who. That final fact confused me a bit; the last I remembered was that the Doctor had disappeared into a void gurning and shouting "No!". Now there was this taller man who'd fallen out of the TARDIS onto a verge somewhere. What was more he didn't seem to have changed as much in the comic I read - they just seemed to have drawn his face a bit thinner. Even though we didn't get a colour TV until quite a while later, somehow this new colour series felt different anyway. After a while I stopped missing Troughton and once The Master and Jo arrived a year later Jon Pertwee was the Doctor, a lisping avuncular figure who knew everything and had a habit of rubbing his chin (or the back of his neck) whilst thinking. 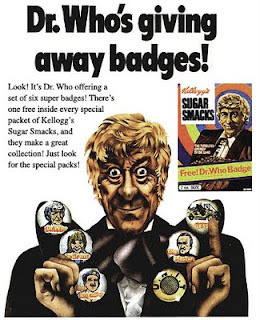 I collected the free badges given away with packs of Sugar Smacks. I still didn't entirely get it all the time of course. During The Daemons (1971) when the Doctor, having been captured by evil Morris Dancers, commands a streetlamp to shatter I completely overlooked Sgt Benton hiding behind a car taking it out with his rifle and thought that it was because the Doctor was somehow magic, despite the strong sceptical pro-science message of the story. The mood of the programme had changed. The Master was usually behind everything and there was not so much lumbering going on any more. Things became more psychological and nightmarish; The Mind of Evil (1971) featured an unseen alien parasite which fed on people's fear - you might think the concept too cerebral for a six year old, but I was gripped. I also still clearly remember the narrative shock I felt when the Doctor unexpectedly returned the Master to the Axon ship at the end of the Claws of Axos (1971). This was well written stuff. Of course I was changing as well; as Pertwee moved into his fourth season and the programme turned ten, I'd just turned eight and was reading a lot. I wouldn't have said I was "obsessed" with Doctor Who at this point, it was still just something that was always there. I could have no more missed an episode than I could have forgotten to have got up in the morning. There was a lot else in it including the plans to build a Dalek for only £15 in materials, which was nevertheless an unreachable sum for an eight year old in those days. Besides, where would we have kept it? Michael Lavin, the school bully, suddenly started being really nice to me on the day I brought the Radio Times Special into school. Even back then I thought this was a rather pathetically transparent ruse to try and get me to let him read it. I had started getting bored with the constant earthbound nature of the programme; I realised this when I found myself excited to read in the Radio Times listing synopsis for the first episode of The Green Death (1973) that whilst the Brigadier was investigating something or other in a Welsh coal mine, the Doctor had problems of his own on the planet Metebelis Three, which sounded much more exciting. Stupid Brigadier! Sadly the Metebelis Three scenes didn't last very long, but happily the story ended up being The One With the Maggots, which I enjoyed anyway. I was to get my wish for more space-based adventures soon. I used to want to be Sgt Benton. I share your partial ennui for the Earthbound U.N.I.T storylines week after week after week. Even though the monsters are a bit unoriginal since T.Davies took over (what have they done with the cybermen? ), the storylines and echoes back to the real world have taken these relaunched series on to a whole new dimension of 'proper' drama. I approve - can't wait to read your take on them.